Announcing the first cohort of APT9 artists, QAGOMA Director Chris Saines said the latest chapter in the Gallery’s flagship exhibition series includes new and recent work by more than 80 emerging and established artists, collectives and filmmakers from more than 30 countries. 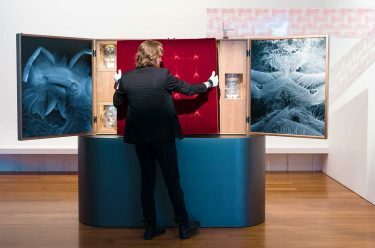 Now in its twenty-fifth year, the Asia Pacific Triennial of Contemporary Art continues to be an important showcase of the freshest, most exciting new work being produced in Asia, the Pacific and Australia, and is an important celebration of the cultural contribution of contemporary art. APT presents a wonderful opportunity for visual artists from across Australia and the Asia Pacific to collaborate and share works that are a powerful expression of their cultures and experiences. Building on the legacy of previous Triennials, the specially commissioned Women’s Wealth Project, introduces audiences to the unique cultural and artistic practices of women artists from the Autonomous Region of Bougainville (AROB) and nearby islands in the Solomon Islands archipelago. Cane and pandanus weaving, shell ornamentation, pottery and body adornment will feature in this project, as well as an immersive multi-channel video installation by rising star, AROB/Australian artist Taloi Havini, and drawings created from the 1930s through the tragedy of the Bougainville Crisis in the 1990s to today. 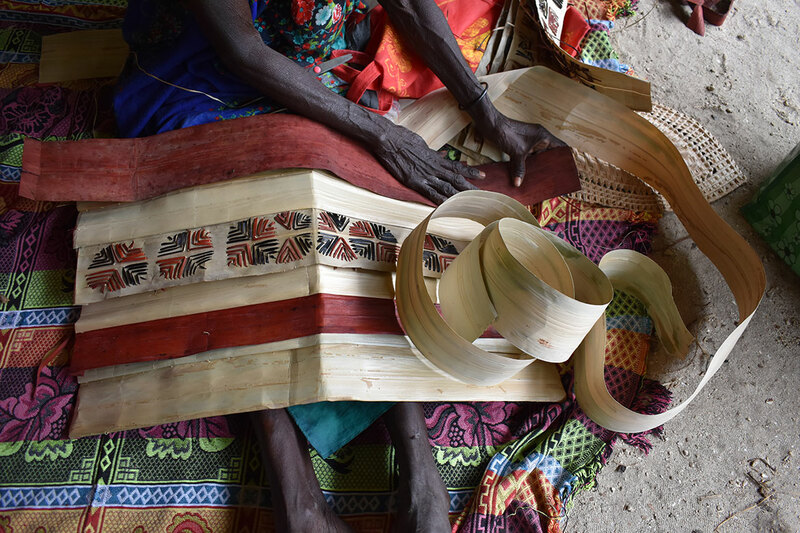 Supported by an Australian Cultural Diplomacy Grant, the Women’s Wealth Project developed out of a week-long workshop initiated by QAGOMA in Bougainville, and it highlights the significance and endurance of women’s creative practices in this locale, expressing a quiet but powerful resilience in the face of major historical and political change. 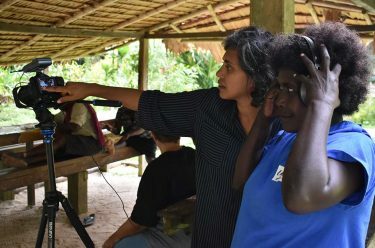 Elizabeth Watsi Saman creating Sinsu, APT9 Women’s Wealth workshop, Chabai, Bougainville, September 2017 / Women’s Wealth Collaborative project developed by QAGOMA for APT9 co-curated by Sana Balai Autonomous Region of Bougainville / Australia b.1957 Nakaripa clan, Hakö people / Women’s Wealth is supported by the Australian Government through the Australian Cultural Diplomacy Grants Program of the Department of Foreign Affairs and Trade. Among the other must-sees in APT9 will be an immersive installation and soundscape by Wiradjuri/Kamilaroi artist Jonathan Jones in collaboration with his long-time mentor Wiradjuri Elder Dr Uncle Stan Grant Snr AM. 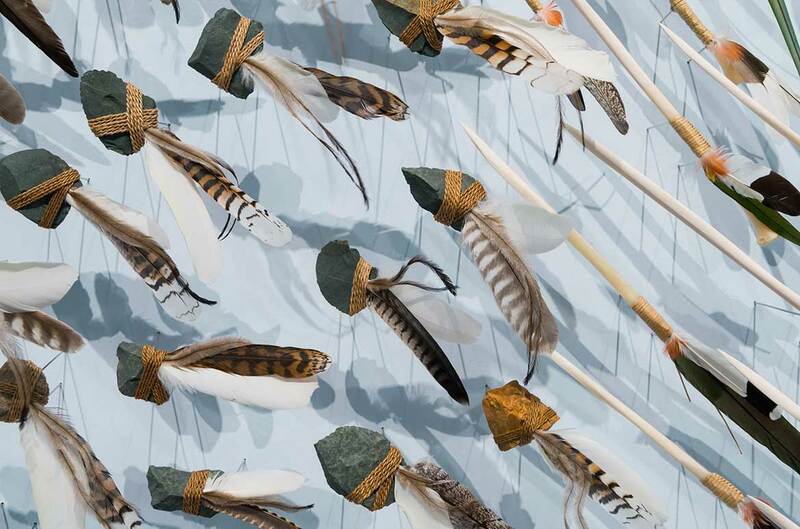 Jones’ large-scale work includes hundreds of hand-made objects and explores the Wiradjuri gulbanha (philosophy) of dhawura (wind). 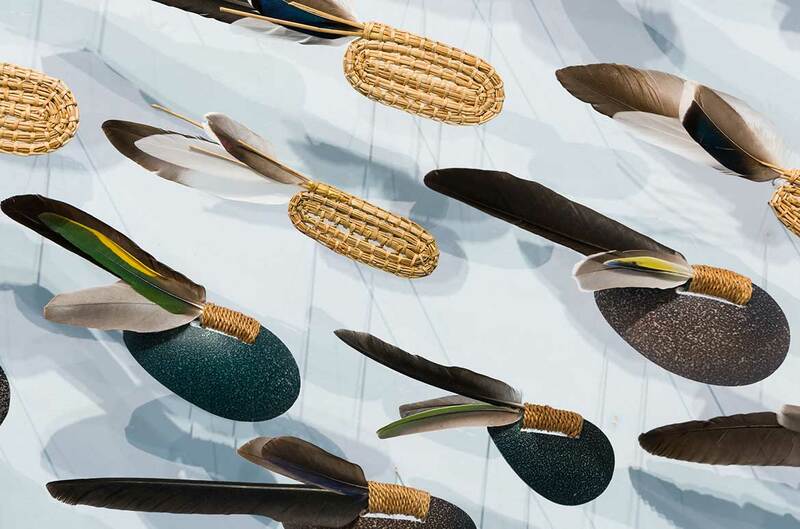 Jonathan Jones, Wiradjuri/Kamilaroi peoples, Australia b.1978, with Dr Uncle Stan Grant Snr AM, Wiradjuri people, Australia b.1940 / (untitled) giran (detail) 2018 / Bindu-gaany (freshwater mussel shell), gabudha (rush), gawurra (feathers), marrung dinawan (emu egg), walung (stone), wambuwung dhabal (kangaroo bone), wayu (string), wiiny (wood), 48-channel soundscape / Sound design: Luke Mynott, Sonar Sound / © The artists / Photograph: Natasha Harth © QAGOMA / This project has been assisted by the Australian Government through the Australia Council, its arts funding and advisory body; the NSW Government through Create NSW; and the Copyright Agency Cultural Fund. This project has also been supported by Carriageworks through the Solid Ground program. Aisha Khalid, one of the most respected and sought-after Pakistani artists working today has created a major new work for APT9, a striking large-scale sculptural tapestry. 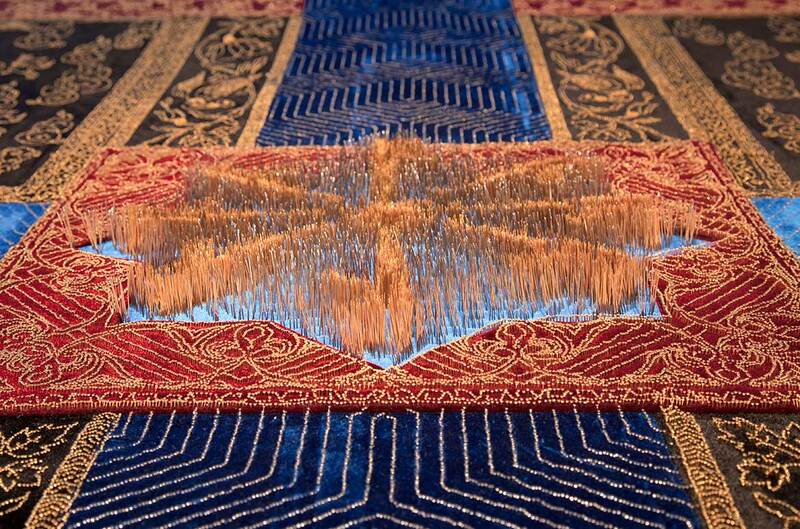 The monumental work, created with fabric and gold and silver pins, weighs up to 200kg and has been commissioned with support from The Myer Foundation to commemorate the 25th anniversary of QAGOMA’s Kenneth and Yasuko Myer Collection of Contemporary Asian Art. Also showing in Australia for the first time, Iranian artist Iman Raad’s fantastical mural installation will draw audiences into a vivid landscape of riotous colour, populated by a seductive, graphic array of birds, fruits and flowers intertwined with social and historical references. 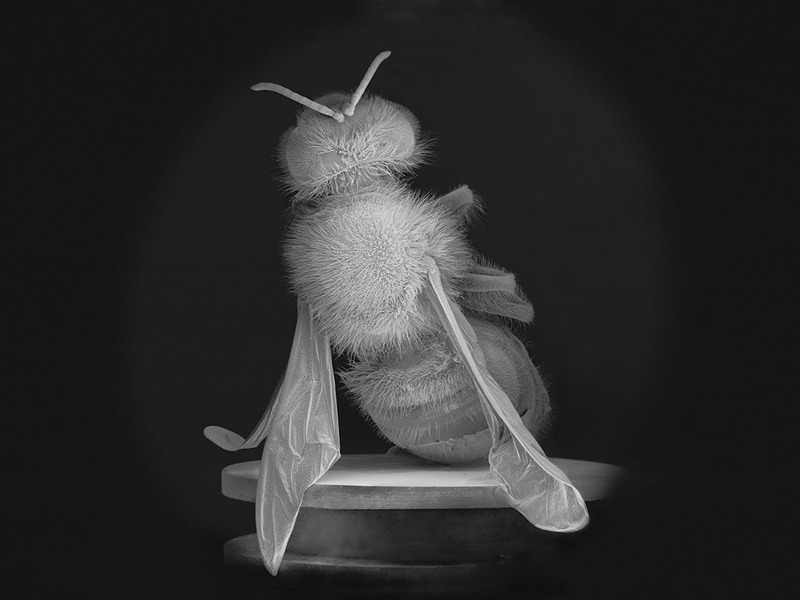 New Zealand artist Anne Noble’s fully functioning bee hive, large-scale photograms and ‘Museum of the Bee’ will focus on of the importance of the honey bee for life on our planet. 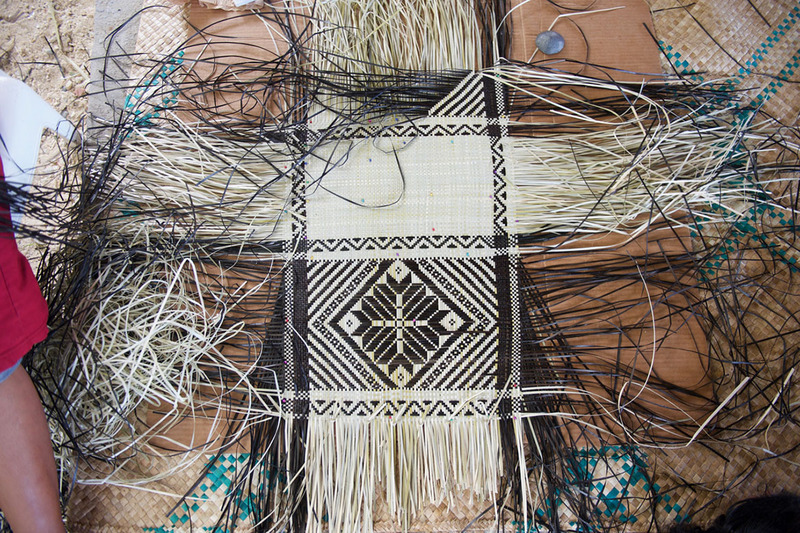 The Jaki-ed Project, developed with poet and environmental activist Kathy Jetñil-Kijiner, will introduce audiences to the cultural significance of Jaki-ed weaving and its connection to the traditional spiritual and social structure of Marshallese life. As with previous exhibition chapters, APT9 will highlight new and expanding creative centres in the region. It will include artists from Laos for the first time and have the largest representation of artists from Bangladesh and the Pacific in an APT to date. The exhibition will feature a wide range of art forms and give particular focus to artists exploring the ongoing presence of spirituality in digital times, the multiple ways that wealth, value and labour operate, the agency of the body, and concerns for others as well as the vulnerability of the natural world. 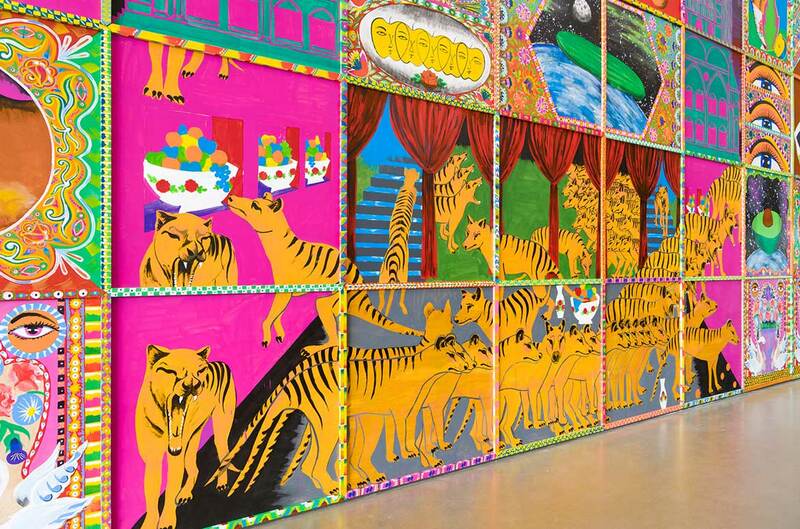 Read more in The 9th Asia Pacific Triennial of Contemporary Art available online or in store. The publication represents an important and lasting document of the current artistic landscape of Asia and the Pacific. Women’s Wealth has been supported by the Gordon Darling Foundation, and the Australian Government through the Australian Cultural Diplomacy Grants Program of the Department of Foreign Affairs and Trade. Anne Noble has been supported by Creative New Zealand.